Intense rain triggered widespread landslides in southern Thailand during the last week of March 2011. This photo-like image shows some of the slides in the forested hills of the Krabi province on the western side of the Malay Peninsula. The freshly exposed brown earth and swollen muddy rivers stand out against the deep green forest. 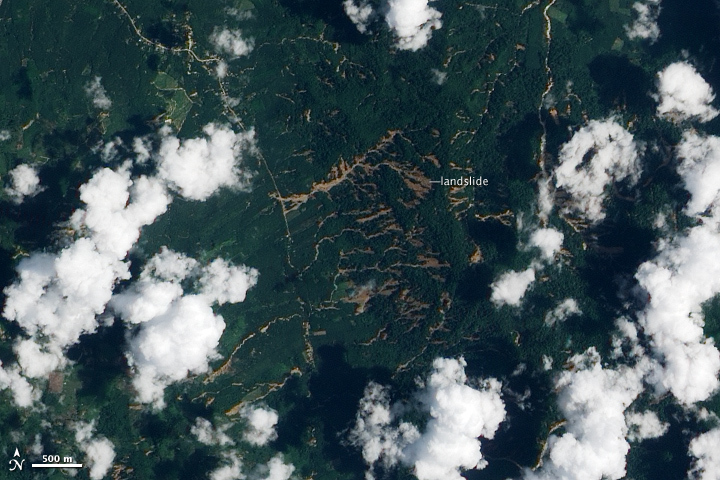 The large image, which covers a much wider area, shows many more landslides, though clouds hide much of the region from view. The Advanced Land Imager (ALI) on NASA’s Earth Observing-1 (EO-1) satellite acquired the image on April 4, 2011. The landslides occurred because of unseasonably heavy rain, during which more than 1,200 millimeters (47 inches) fell. The ensuing floods and landslides affected more than two million people and killed 53 in 11 Thai provinces, said news reports on April 5. One large slide (mostly under clouds, immediately southeast of the area shown in the web image) buried a village of about 100 households. BBC News. (2011, April 5). Thailand flood death toll rises as rains ease. Accessed April 5, 2011. The Nation. (2011, April 5). Bt6.1bn relief fund as toll hits 51 dead, 21,000 ill. Accessed April 5, 2011. The Nation. (2011, April 1). Floods of fury. Accessed April 5, 2011. The Nation. (2011, March 31). Krabi village swept away. Accessed April 5, 2011. Absolutely love the new design. I were pleased with this article. Credit for the nice write.